Gutters are an often overlooked, and yet incredibly important aspect of a building. If left unchecked, after a few months gutters will be blocked by the elements such as leaves, ice, moss and in some cases dead animals. This can lead to very severe damage to a property. All it takes is heavy rainfall and your entire building could become flooded, with all your possessions lost or destroyed. To prevent damage and all sorts of other effects of neglecting the gutter, such as an atrocious smell, we recommend to clean them at least once a year. The best time to do so is the beginning of the winter before the bad weather starts to kick in, but after all the leaves have fallen down. Cleaning up gutters can be incredibly tricky though, especially considering that they need to be accessed from the top in order to be cleaned properly. That’s where R.A.I.L.’s experienced and well-trained professionals come in. We are greatly prepared to perform a great job at any height, thanks to CSCS certificate. With our rope access services, you can be sure that you’ll have your gutters cleaned in the quickest, cheapest, most efficient, and safest manner. It also prevents your home or bureau from getting damaged and provides you with an assurance of great performance of your gutters. 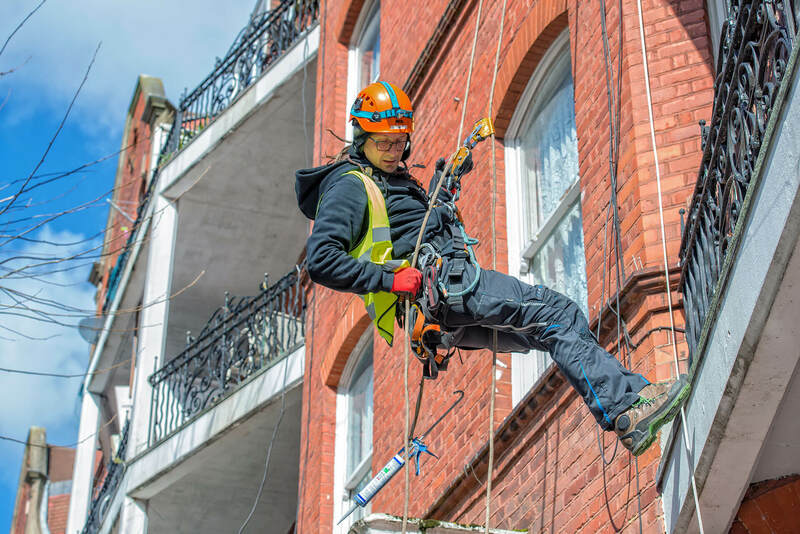 Using only a handful of tools, our rope access technicians are unencumbered and can perform complex operations at heights without any extra effort, which means that for less money you are getting the best possible service. Contact us to book our services today! What Types Of Cleaning Services DO We Provide? Clean windows can make a real difference. We perform rope access window cleaning at any height. The best way to get rid of dirty elements is high-pressure cleaning. We will do it for you, no matter the height. Even the most beautiful and detailed masonry deteriorates over time. Keep the bricks and masonry clean with our help. It’s incredibly important to keep your retail sign clean at all times as it’s the first thing many customers see. With rope access, nothing is too high to clean. Whether it’s routine cleaning or removing graffiti, we will do it. Our technicians can perform painting operations on brickwork, masonry, windows, and roofs. We offer building surveying services, including drafting, photographic recording, and more. Thermal insulation and water resistance will preserve the looks of your building. Our waterproofing service will help you make sure your roof is completely sealed at all times. Birds won’t disturb you if you repel them with our bird spikes. We’ll help you make sure they won’t bother you. Buildings deteriorate over time and often require repairs in hard-to-reach places. We can fix them. GDPR GDPR I hereby agree to the processing of my personal data by Rope Access In London with the head office at 155 Regent’s Park Rd, Camden Town, London NW1 8BB for the purposes of receiving a reply. I have the right to access and edit my personal data. At R.A.I.L. Ltd., we offer the best rope access services available in London. Take a look at all our client reviews to find out for yourself. If you find yourself in need of someone to repair, paint, or otherwise do anything with your building that involves operating at considerable heights, book our services using our online form. R.A.I.L. works for both private and commercial clients that require any kind of work that needs to be done at considerable heights. Rope access is a technique used to access hard to reach places. It can be used for cleaning, waterproofing, cladding, painting, and much more. Give us a call or book us through the online form available on our site. We will do anything related to working at heights. Copyright 2019 RAIL Ltd. Created by Neadoo Digital.